Datacolor announced the Spyder5 monitor calibration solution, claiming "up to a 55 percent improvement in tonal response, resulting in more accurate shadow detail and smoother gradients" over its previous model. As with the previous model, there are three versions of the device: Express, Pro and Elite. All Spyder5 product versions adjust or calibrate all laptop and desktop monitors to an industry color reference standard so colors are accurate and shadow and highlight details are preserved. "Seeing accurate color makes photo editing easier and faster," said Heath Barber, Datacolor imaging market manager, "and provides better print matching so less ink and paper are wasted. Spyder5 saves photographers time and energy so they can spend more time doing what they love doing -- taking photographs." The new Spyder5Express, Spyder5Pro and Spyder5Elite are available now online or directly from Datacolor. The Spyder5Express is priced at $129, Spyder5Pro at $189 and Spyder5Elite at $279. LAWRENCEVILLE, N.J. -- Datacolor has released Spyder5, the next generation of its popular monitor calibration solutions. Datacolor Spyder5 is the color accuracy solution designed by photographers for photographers, to help them see, share and print their images, just as they intended. The three versions of Spyder5 -- Express, Pro and Elite -- reduce the hassle of figuring out why digital photographs look different on screen and why the colors on screen don't match photo prints. All Spyder5 product versions adjust or calibrate monitors to an industry color reference standard so colors are accurate and shadow and highlight details are preserved. With true screen color, photographers can more accurately edit their photos and achieve better print matching. The next generation Spyder5 colorimeter is compact, portable and protected for use on all laptop and desktop monitors. Datacolor has redesigned Spyder's patented 7-detector optical engine to deliver up to a 55 percent improvement in tonal response, resulting in more accurate shadow detail and smoother gradients. "A picture is more than a photograph -- it contains a photographer's emotional connection with the scene they're shooting. It's critical that a photographer's computer monitor displays accurate color, so they can see, share and print their captured moments just as they intended them," said Heath Barber, Imaging Market Manager, Datacolor. "Spyder5 is an important tool for all photographers. Spyder5 calibrates a computer monitor to industry color reference standard so an image's true color, with accurate shadow and highlight detail is displayed. Seeing accurate color makes photo editing easier and faster and provides better print matching so less ink and paper are wasted. Spyder5 saves photographers time and energy so they can spend more time doing what they love doing -- taking photographs." 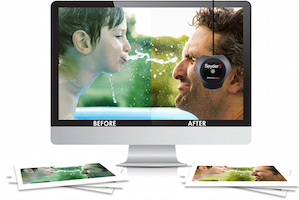 Spyder5Express is a cost-effective tool for serious photographers seeking an easy-to-use color accuracy solution through a simple, interactive four-step process guide. Using it's before and after feature, users can evaluate calibration results using a professional Datacolor composite image. Spyder5Express also supports multiple monitor calibrations. Spyder5Pro is ideal for photographers and creative professionals looking to take their skill and artistic vision to the next level by achieving precise color accuracy. Advanced features include an integrated ambient light sensor for room light monitoring, an extensive range of calibration settings, display analysis and the ability to import images for before and after calibration evaluation. Spyder5Elite offers professional photographers, studios and calibration perfectionists who demand the highest levels of color accuracy, ultimate control of the calibration process. Spyder5Elite offers a built-in tripod mount to easily calibrate front projector displays. Expert features include an unlimited range of calibration settings, comprehensive display analysis, advanced before and after evaluation of imported images, monitor matching and tuning and optimized gray balance routines. The new Spyder5Express, Spyder5Pro and Spyder5Elite are now available at photography and consumer electronics retailers nationwide or online at datacolor.com/spyder5-pr. The Spyder5Express is priced at $129, Spyder5Pro at $189 and Spyder5Elite at $279.